Played by: John Kirkpatrick, Noel Hill, Niall Vallely, Scan Tester, Fred KiIlroy, Chris Sherburn, Andy Turner, Bertram Levy, Frank Edgley, Andrew Blakeney-Edward, Roger Digby with Bob Davenport, Nigel Chippendale, Harry Scurfield, Will Duke, Regardt de Bruin, Tom Lawrence, Roger Edwards with Trio Threlfall, Mary MacNamara, Kate McNamara, Mandy Murray, John Watcham, Zulu Squashbox, Zak van der Vyver, Felix Castro, Jody Kruskal, Alan Day. 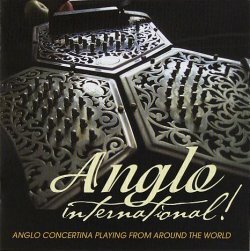 Something of an unusual offering here - a triple CD of Anglo-German concertina music from across the world. Some of the players can justifiably called traditional, as can a good majority of the tunes played. According to the very well-produced 48-page booklet, none of these tracks have been commercially published before, several of them can be termed 'archive material', and many have been specially recorded for this publication. I have to say that it's a very professional-looking package, presented in a fat VotP style case, with a substantial booklet which provides a mini-biography of each player and sometimes a bit of background to the tunes. Not as detailed as MT readers might wish, but it's a pretty good job - and not really aimed at the likes of us. Further, most of the tunes are very well recorded, and those which aren't - the archive material - have been cleaned up pretty well. I'm not going to do a long and detailed review, since much of the 4 hours of music is rather outside the scope of this magazine, but a few general comments can reasonably be made. I described this earlier as Anglo-German concertina music from across the world, so it's worth clarifying that the performers come from England, Ireland, USA, Spain, and South Africa. That said, I think it's a bit of a shame that such a substantial proportion of the music is either Irish, or 'Celtic' influenced. Further, that those players who have developed the most advanced techniques seem, for the most part, to have sacrificed much of the quality of their music to mere technical virtuosity. I should also add that as well as lots of tunes, there are about half a dozen songs - accompanied by concertina. Since many of the tunes are new to me, I don't know exactly how accurate the booklet is, but I can count, so I did notice that Mary MacNamara's excellent contribution of three sets of tunes are either misnamed or in the wrong order; track 25 is reels and track 26 is jigs, not the other way about. Anyone who likes the concertina will love this fine set of CDs, anyone on the lookout for some good and less well-known tunes will find plenty here, and I honestly think that almost anyone will enjoy most of the 4 hours of music on offer here. You can buy it at: www.angloconcertina.co.uk for £25 inc UK p&p.